After being held without formal sentencing for participating in protests, Chinese authorities have released Tibetan prisoners in states of poor health and with indications of abuse. Chinese authorities in Qinghai and Sichuan provinces have released two Tibetan prisoners in poor health after jailing them for suspected involvement in a self-immolation protest and for taking part in other protests challenging Beijing’s rule in Tibetan areas, sources said. One was detained for almost a year without charges and was never formally sentenced, a Tibetan living in Europe told RFA’s Tibetan Service this week, citing contacts in the region. “Tamdin Tsering was released on July 29  at around 11:30 a.m. from a prison in Xining in Qinghai,” he said, speaking on condition of anonymity. Tsering, a native of Tsekhog (in Chinese, Zeku) county in Qinghai’s Malho (Huangnan) prefecture, was detained in December 2012 “on suspicion of involvement in the self-immolation of a young student,” a teenage girl, the source said. “She died calling for the long life of [exiled spiritual leader] the Dalai Lama,” he said. After the protester’s death, several students from her middle school were detained and subjected to intense questioning, but were later released, a Swiss-based Tibetan named Sonam told RFA’s Tibetan Service, also citing contacts in the region. 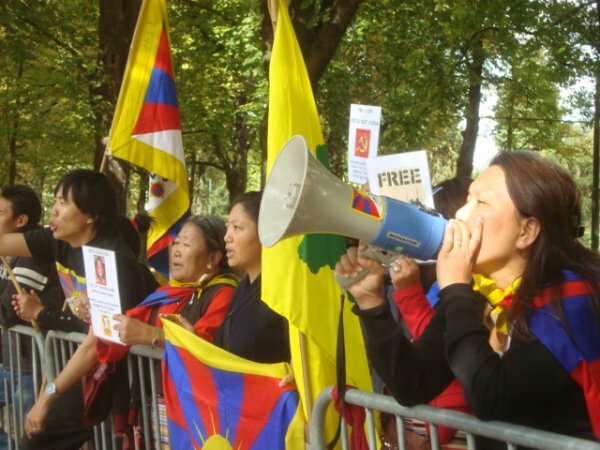 “Tamdin Tsering was detained around the same time and was accused of actions aimed at ‘splitting the motherland,’” a charge often brought against Tibetans deemed to support the separation of Tibetan areas from Chinese rule, Sonam said. Following his release, Tsering was found to be in poor health due to malnutrition and harsh treatment in jail, the first source said. Meanwhile, on July 24,  authorities in China’s Sichuan province released another prisoner, also in poor health due to alleged abuse in custody, after he was jailed for taking part in protests challenging Chinese rule in Draggo (Luhuo) county in January 2012. Sonam Rinchen, aged about 29, “was taken away on Feb. 12, 2012, and disappeared for a while,” Palden, a Tibetan monk living in India, told RFA’s Tibetan Service. “Later, he was known to have been sentenced to one year and six months in prison,” Palden said. To date, a total of 121 Tibetans have set themselves ablaze in self-immolation protests challenging Chinese rule and calling for the return of the Dalai Lama. The burning protests come as reports indicate that Tibetan human rights have plunged to a new low amid arbitrary arrests, detentions, torture, and the erosion of language and cultural rights. Early this month, Chinese police in Sichuan province fired on unarmed Tibetans celebrating the Dalai Lama’s birthday, wounding about a dozen people, some seriously, according to sources in the region.